Home has a lot of deferred maintenance but has lots of potential with large rooms, natural woodwork, and nice setting. Lays adjacent to home and 6 acres! 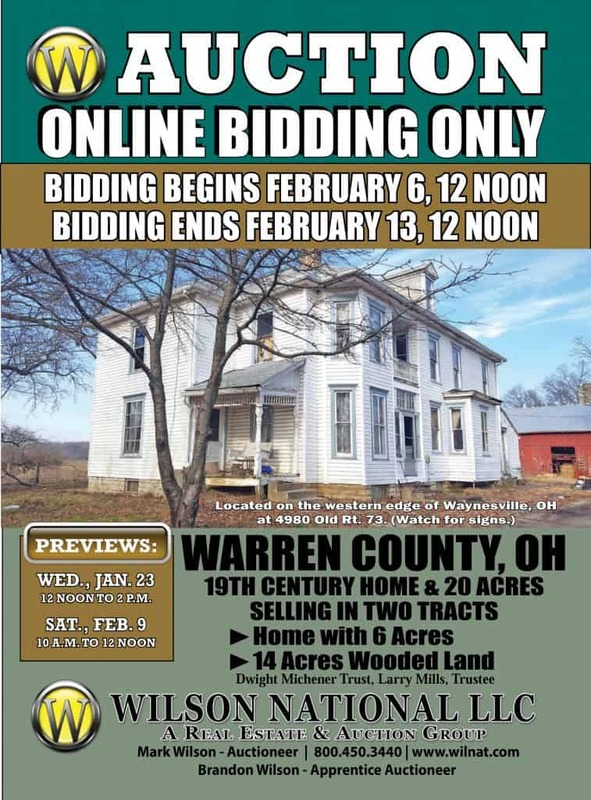 PREVIEW: WEDNESDAY, JANUARY 23 FROM 12 NOON TO 2 P.M.
Down Payment: Ten Percent (10%) Nonrefundable Deposit due within forty eight (48) hours of the completion of the auction. The Nonrefundable deposit may be paid in form of cash, personal check, business check, or cashier’s check. Checks will be made payable to Wilson National LC Trust Account. Acceptance of Bid Prices: Once you place a bid, it cannot be removed, even if you bid incorrectly. Please verify all bids before submitting. If you hold the highest bid at the conclusion of the auction and do not execute and return Confirmation of Sale and your nonrefundable deposit within forty eight (48) hours of the conclusion of the auction then you will be considered in default. If your closing is delayed for any reason, by you, or anyone working on your behalf, including lenders, you may be declared in breach of this contract, forfeit all deposits made, and will be liable for any and all costs incurred by the seller and Wilson National LLC incurred in a subsequent resale of the property. All successful bidders are required to sign a Confirmation of Sale, Consumer Guide to Agency Relationship, Agency Disclosure Statement, and a Lead Base Paint Disclosure within 24 hours of the end of the auction. Your bidding is not Conditional Upon Financing, so be sure you arranged financing, if needed, and are capable of paying cash at closing. This auction is subject to seller confirmation. Closing: Closing shall occur on or before April 1st, 2019. Real Estate Taxes: Seller to pay 2018 taxes due and payable 2019, buyer thereafter. Lead Based Paint Disclosure: Any home built previous to 1978 has the potential of lead base paint being present. Seller has no knowledge or reports indicating the presence of lead base paint. Purchaser can have and inspection if so desired but will sign a disclosure waiving their right to an inspection that would have any effect on the agreement to purchase. DISCLAIMER & ABSENCE OF WARRANTIES: All information contained in this brochure and all related materials are subject to the terms and conditions outlined in the agreement to purchase. Announcements made by the Auctioneer at the auction podium during the time of sale will take precedence over any previously printed material or any other oral statements made. 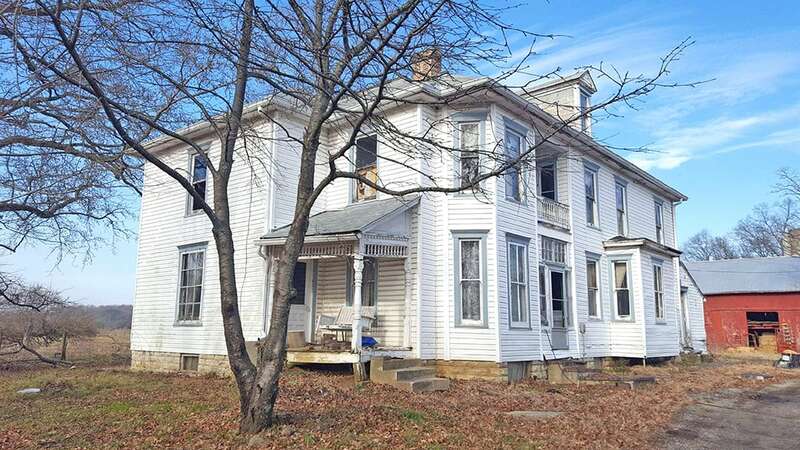 The property is sold on an “As Is, Where Is” basis and no warranty or representation either expressed or implied, concerning the property is made by the seller or the auction company. Each potential bidder is responsible for conducting his or her own independent inspections, investigations, inquiries and due diligence concerning the property. The information contained in this brochure is believed to be accurate but is subject to verification by all parties relying on it. No liability for its accuracy, errors or omissions is assumed by the seller, the broker or the auction company. All sketches and dimensions in marketing materials are approximate. Conduct of the auction and increments of bidding are at the direction and discretion of the Auctioneer. Auction firm has the right to bid on behalf of buyers or sellers. The seller, broker and auction company reserve the right to preclude any person from bidding if there is any question to that person’s credentials, fitness, etc. All decisions of the Auctioneer are final. For FSA 156EZ info, additional documents and disclosures go to www.wilnat.com.